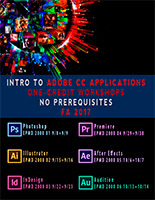 The School of Communications is again offering a series of weekend, one-credit seminars that introduce students, faculty and staff to several Adobe applications. The courses are prerequisite-free, open to anyone (students, staff and faculty) at Webster, and will meet from 5:30-9:30 p.m. Friday and all day Saturday. The courses are offered early in the semester so that students are able to utilize the skills in their respective courses immediately in the fall semester. Adjunct faculty member and space law expert Edythe Weeks spoke at the Manfred Lachs Conference, where participants discussed the way forward 50 years after the Outer Space Treaty of 1967. ... Zlatko Cosic's film "It Can't Go Forever #1" will screen in Nepal. ... Research Services librarian Donna Church was one of six notable book reviewers honored by Reference and User Services Quarterly (RUSQ). The School of Communications will offer a series of weekend, one-credit seminars that introduce students to several Adobe applications starting in the fall of 2017. The courses are prerequisite-free, open to anyone at Webster, and will meet from 5:30 p.m.-9:30 p.m. Friday and all day Saturday. The courses will be offered early in the semester so that students are able to utilize the skills in their respective courses immediately in the fall semester.